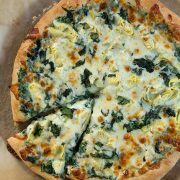 Since I’ve started this blog I think I’ve mentioned grilled pizza probably four or five times and how much I love it, yet I’ve never posted a recipe. Why have I waited this long? This is one of my favorite things to make and it’s actually one of the first things I learned how to cook. I started making them when I was probably 17 and I’ve made them all summer long ever since. I’m sure I’ve made grilled pizza far more than I’ve made oven baked pizza. 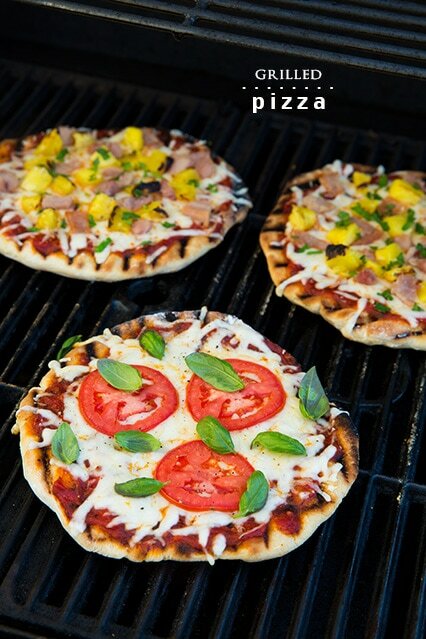 I love the flavor of grilled pizza and I love the deliciously crisp crust. I also like how these are fun for parties and are perfect for individual pizzas. I frequently make these when I have family over then just have a pizza topping bar and everyone assembles their own pizza and I grill them. The kids love to assemble their own mini pizza. I used to be nervous about these sticking to the grill so when I first started making them I’d lay them each over a piece of the reynolds non-stick foil. Then one day I decided to try it without (probably because I was out of it) and they turned out perfectly fine. They turned out much better actually and tasted better. Just be sure that you brush the grill grates lightly with oil and brush the pizza crusts with oil so you aren’t trying to scrape them away from the grill grates. I’ve tried so many pizza sauce recipes and I’ve decided I prefer my pizza sauce thick, if it has a fairly thick consistency it just doesn’t seem to soak into the pizza crust and make it soggy like some of the more watery sauces do. If you don’t want it as thick as I like mine, you can just reduce the amount of tomato paste. If you haven’t tried grilled pizzas I hope you try these soon, they are the closest you can get to that stone fired oven flavor from your favorite pizzeria (it is my dream to have a stone/wood fire oven…but until then these will more than suffice :). Everyone always loves them! Enjoy! Prepare pizza dough and let rise, or use store-bought. Shape dough into 6 rounds. Grill until golden brown on bottom. Remove from grill, cover golden brown side with toppings, return to grill and cook through. 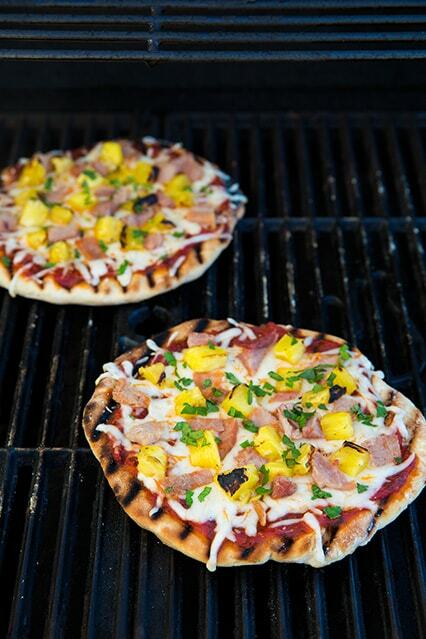 One of my favorite summer-time recipes and the perfect way to cook pizza at home! Once you try grilled pizza you'll be hooked. It's easy to make and has great flavor! To save time use a store-bought dough and deli pizza sauce. In the bowl of an electric stand mixer, combine yeast, 2 tsp sugar and 1/2 cup warm water and whisk until yeast has dissolved. Allow to rest 5 minutes. Add in remaining 1 cup warm water, olive oil, salt and vinegar. Fit mixer with whisk attachment and set to low speed and slowly add in 1/2 of the flour and mix until combined. Switch to a dough hook and slowly add in remaining flour, then knead mixture on medium-low speed about 7 - 8 minutes until smooth and elastic (dough should be slightly sticky but should not stick to a clean fingertip). Cover bowl with plastic wrap and allow to rest in a warm place until doubled, about 1 1/2 - 2 hours. Heat olive oil in a medium saucepan over medium-high heat. Once hot add garlic and saute 30 seconds. Add remaining sauce ingredients (ending with salt and pepper to taste) and whisk to blend. Bring just a bubble then reduce heat to a simmer. Allow to simmer 20 minutes, uncovered, stirring occasionally. Preheat grill to medium heat. 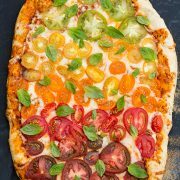 Gently punch pizza dough down and divide pizza dough into about 6 equal pieces (this may vary depending on how large you want your pizzas and how thick you want the crust). Dust work surface with flour, then roll and stretch dough to desired size and thickness (making an even thickness all the way around - no rimmed edge necessary). Brush clean grill grates of a gas grill lightly with oil. Brush tops of shaped pizza doughs with olive oil then using a pizza peel, transfer pizza doughs to hot grill - olive oil brushed side down (I flip them while dropping on grill, if making a large pizza though I wouldn't recommend flipping). Cover with grill lid and allow to cook until golden on bottom, about 2 - 3 minutes. Remove from grill, brush tops of crusts with olive oil, then flip to opposite side. 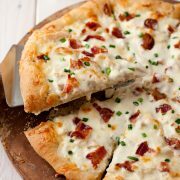 Layer sauce and desired toppings over tops (over grate marked side of pizza crust). Return to grill, reduce heat slightly and cook until cheese has melted and bottom is golden, several minutes longer. Serve warm. *Store bought dough works great too. **For any of the herbs listed, you can use fresh in place of the dried (I did with about half of them). If using fresh just triple the amount of the dried.